Okay, well, there are probably lots of other options, but that’s where Jacob Tomsky landed, parking cars. From there, he began to move up in the hotel, hitting the front desk and even working as a manager in the housekeeping department. The longer he worked in hospitality, though, the less suited he became for jobs elsewhere. In fact, the longer he worked reception at a single hotel, the less able he became to even move to another hotel because of the way that pay and preferred shifts work in the industry. So it turned out that Jacob just had to stay. Stay, and begin to grow slightly bitter. As a result of Tomsky’s ultimate frustration with the hospitality industry, we have Heads in Beds. Tomsky chronicles much of his own personal work in hotels, hitting some of the highest-interest, most drama-filled interactions. This isn’t just someone’s catalog of complaints, though. Tomsky uses many of the incidents he recounts to give tips to the traveler in order to ensure the best possible hotel stay: how to get the best rooms, how to never pay for minibar items, and even how to get those movies removed from your bill. Also, after reading Heads in Beds, you will always, always, always tip the bellman. Tomksy is an engaging writer, and the way he alternates between the inward look of his personal story and the outward look of his tips for travelers works very well together. There is enough balance that whichever aspect of the memoir you are reading for, I think you will be happy with it. 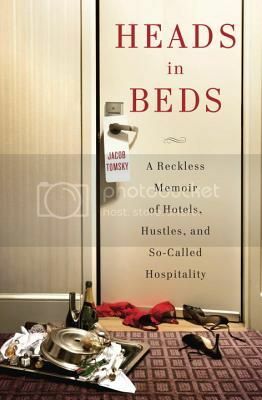 Heads in Beds is a must for travelers who want to know what is really going on behind the scenes in the hotels where they stay. Recommended. I travel frequently for work so I know this book would be equal parts fascinating, helpful, and frightening I’ve put this on my Goodreads TBR list. Thanks for putting it on the radar! I used to work at a Radisson so I think I would really enjoy this book. Plus I read a similar one not long ago called Waiter Rant and loved it! I haven’t read Waiter Rant, but it is listed on a comp on Heads in Beds, so this sounds perfect for you.